FTF-I values and appreciate the interns and volunteers coming from all over the world and contribute with their skills in the growth of the organization. These interns play a very important role in achieving our mission. In return they get the opportunity to visit our member organizations, which provides a wide scope for learning. They get the opportunity to meet the artisans working at the grassroots level. This time, in our winter internship programme, we got the opportunity to welcome very talented students from Management background from Indian Institute of Foreign Trade (IIFT), Delhi and Narsee Monjee Institute of Management Sciences (NMIMS), Mumbai successfully completed their internship program at our Delhi office. Students from Indian Institute of Foreign Trade (IIFT) joined FTF-I from 17 December 2015 Delhi and Narsee Monjee Institute of Management Sciences (NMIMS), Mumbai, joined FTF-I instates in Delhi and Mumbai. 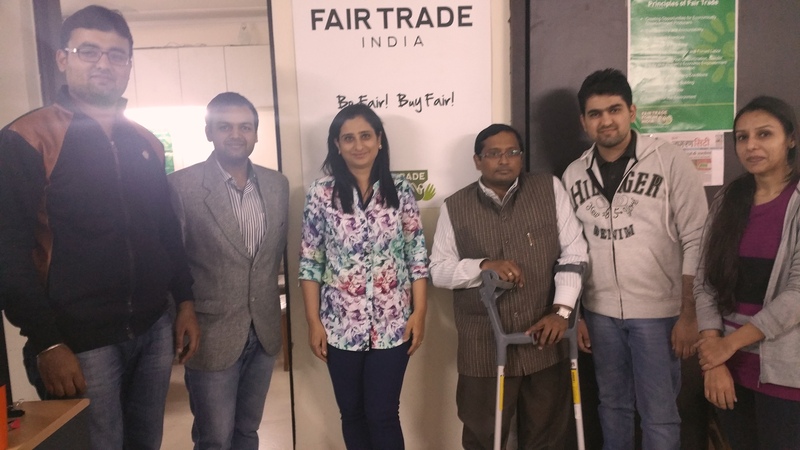 During their internship period students visited Delhi based Fair Trade India branded shops and contributed in the research project of FTF-I. Rohit and Nikhil from IIFT, completed their internship programme from 17th December, 2015 to 11 January, 2016. Read what IIFT intern, Rohit has to say, link to the blog. Abhishek, Dhreej and Mayank from NMIMS students completed their internship from 01st February, 2016 to 24th February, 2016. As part of the Indian Institute of Foreign Trade (IIFT) NGO Partnership program students were required to choose an NGO from the list of participating NGOs in the program. I chose Fair Trade Forum-India out of many options. The reason I chose FTF-I was that I thought that as the NGO has something to do with ‘trade’, this would align more closely with what we are learning and practicing at IIFT, Delhi. Little did I know at that time that FTF-I (part of Fair Trade International world community) was much more than trade. It is doing something truly different than most of the other NGOs. The first day, we met the staff and we were surprised to see our 3 week schedule was already prepared with the objectives and deliverables. My work, quite aligned to my profile, dealt with preparing a compendium on research papers and literature on Fair Trade which will be of help to FTF-I in preparing the Fair Trade Status Report. Apart from that the 2 of us had to prepare a Shopping Guide for the customers who have an eye for Fair Trade products. In it we prepared the pitching material for the producer and marketing organization linked to FTF-India. Fair Trade is quite different from the Free Trade. Most of us would have heard about the WTO, the nodal organization for the promotion of free trade. Fair Trade International and World Fair Trade Organisation work in Fair Trade domain. Fair trade traces its beginnings to the ideas propounded by Max Havelaar and Barrett. You would be wondering what really is Fair Trade….? Fair Trade, contrary to free market hypothesis, focuses on the well-being, both socially and economically, of the workers and producers working away at the bottom of the pyramid in South countries. It seeks to protect the artisans, producers, vendors and others from the vagaries of free-trade price shocks by building long term and organic relationships between the North Consumers and South Producers. It seeks to incorporate a meaningful social premium while pricing the goods. In achieving its objectives, it makes sure that the products satisfy the environmental standards and child labour standards and social justice is rendered. Fair Trade Forum-India is part of the Asian Chapter of World Fair Trade Organisation. Apart from certifying various manufacturing, producing and marketing organizations as Fair Trade complying, it also conducts regular workshops, Fair Trade Fests and Trade Fairs in order to find new ethical consumers for the products and spread the message to every nook and cranny of our country. From time to time it has looked for new partnerships, especially with E-commerce ventures and online marketers in order to keep up with the present times of digital age and is trying to use the online medium to raise more awareness about the Fair Trade. In order to fill some verve and excitement we were given an option to visit some of the Fair Trade Shops (I almost forgot to add FTF shops. This is an initiative to bring Fair Trade products in limelight and an attempt to mainstream the products into conventional markets.) Nikhil and I lapped up this opportunity and visited Aprajita Trust in Qutab Institutional Area and MESH (Maximizing Employment to Serve the Handicapped) shop near Ansal Plaza in Delhi. The former is a shop run by Aprajita Trust, sheltered in the serene surroundings of Qutab Institutional Area and the Sanjay Van. From the discussion we had with the shop manager we could gather that the shop acted as a nodal point for exporting and selling handicrafts sought from weavers and artisans to business clients. On the other hand, MESH shop seeks most of its products from people afflicted with leprosy and differently-abled people. The shop manager, himself afflicted with leprosy, was the most joyous and active person I have had seen in my life. He is the epitome of hardwork who in many ways is responsible for the oft-quoted cliché: where there is will there is a way… A polite request for a mugshot was enough to persuade him to stand by our side and smile in his disarming way. Cheers to the life and Fair Trade Forum India! Smile for the shutterbugs please…. In the celebration of Christmas and New Year, Purkal Stree Shakti Samiti took part in the Mussoorie Winterline Carnival held from 26th to 30th December, 2015 at Chruch Gate Mall Road, Mussoorie, Uttarakhand. Mussoorie Winterline Carnival focuses on highlighting the tradition and art of the state. It ensures to entertain and arrange everything to all age groups, from arranging many concerts, different shows to providing lot of attractive options for shopping. Purkal Stree Shakti became a part of this event and showcased its beautiful work done by the artisans of Purkal Village.